Beautiful home completely renovated on the inside. Only the best was put into this renovation. Home overlooks the widest part of the lake and has a gentle slope down to the waters edge with a large covered dock with swimming platform and swimming ladder. Great mountain views look over the widest part of the lake and wide water views on deep water. Home is located on a mountain view lot, double dock with swim platform and outdoor deck over looking the lake. Fire pit over looks the lake. Hot tub and outdoor ping pong table complete the offering. We have a pontoon boat that is available for you during your rental from first of April - end of October. Lake levels must be at 1770 to have boat in lake. Please just sign our release of liability form. We do charge a nominal daily fee for maintenance to cover our costs which is not included in the on line quote. The cost is 50.00 per day and we do not charge for check in/out day. We also collect a separate $500.00 boat security deposit that we collect before check in and refund at check out. The use of the boat is optional. Home features a living room, dining area, kitchen combination, queen bedroom and bedroom with two twins that share a bathroom on main level. There is a beautiful stone fireplace in the living room with a wide, expansive deck furnished with a table for 6, comfortable deck furniture and a grill. Two 42' Plasma TV's with High Definition. Satellite TV with numerous premium TV packages. East and West Coast feeds for network TV which is rarely available. Downstairs at lake walk out level there is an additional family room area, King MBR with large walk in closet, and beautiful Master Bath. Another 1/2 bath as well and large laundry room. Home is decorated well and comfortably with everything needed in the kitchen. Granite counter tops. We like to cook and provide everything you need to cook. All GE Profile stainless steel appliances. We will accept your pets. We understand they are part of the family. Please let us know if you have pets or not so that we may cover the extra cleaning. WiFi located throughout home. You will not be disappointed! We own 3 properties in the Blairsville area because we love it so much. The cool weather compared to Home in Atlanta, great mountain views, and the lake that is rarely crowded. The home has almost all repeat renters. We would love to share our home with you. MBR bath has double sinks, walk in shower. Bathroom two is a hallway bath and has shower/tub combo. Half bath on lower level. Basic cleaning supplies, some basic cooking items. Seats 6. Outdoor table seats 6. We have multiple channels and movie stations. We also have feeds from both west and east coasts which are no longer available to subscribers. Nottely Reservoir lies in the state of Georgia on the southeastern edge of the Tennessee River watershed, nestled in the mountains and valleys of the Chattahoochee National Forest. This mountain lake with deep, clear water is a perfect place for jet ski fun while taking in the surrounding scenic views Lake Nottely is 20 miles long and has 4,180 surface acres at normal summer pool elevations. Construction of Nottely Dam began in 1941 and was completed in 1942. The dam is 184 feet high and stretches 2,300 feet across the Nottely River. Nottely has a flood-storage capacity of 100,000 acre-feet. Water levels vary by about 32 feet per year with full pool at 1,779 feet. The Chattahoochee National Forest, which borders a substantial portion of the lake, adds to the scenic quality of the area. Nottely is noted for its black and striped bass, walleye, rainbow trout, and bass which the state of Georgia has stocked to enhance fishing opportunities. This is the second time we have rented in Georgia. This cabin is exactly how it is described. Was as simple as showing up and adding food to the refrigerator and we was set for the week. The water level was a little low so I think that threw off the fishing some but as they say a bad day of fishing is still better then a good day at work and this cabin made that happen for me and my family. We had a great weekend in this very clean, updated house. The kitchen was stocked with all the pots, pans, and gadgets we needed. The hot tub and outdoor fire pit were great. The mattresses and linens and comfortable and high quality. The owner is responsive and easy to work with. Hope we can return in the summer and enjoy the lake and boat! Wonderful Christmas & New Years with the family in a great place. We love this place & will be back next year for the holiday’s. This was our second year in the house for the holiday’s. We love the location & the friendly neighborhood. family and will be back to stay again another Time in the future. We loved exploring the area but wished we had more time to see everything Blairsville has to offer. Best wishes to you and your family. Happy Holidays. Thank you for your lovely review. We enjoyed having you and hope you will come again. Lori. Luxurious and spacious, the view of the lake is very nice . The house well equipped with everything you need. Excellent place to relax and have fun! This the 2nd property of Lori High that we stayed at in the last two years. There is everything you need to have available to feel like your in your home away from home. The house is clean and cozy. We really enjoyed to back porch and use of the pontoon boat. Lori High is very responsive to any question or need and has a friendly maintenance man that lives in the area to assist as needed. We plan on coming back next year for our yearly family get together. Vogel State park is approximately 30 miles. Two large white water rafting areas are within 30 - 45 minutes. Fly fishing, hiking are some of the other activities located near by. We are a 20 minute drive to the John Campbell Folk School. The new Harrah's Casino located in Murphy, NC is a 15 minute drive from our home. 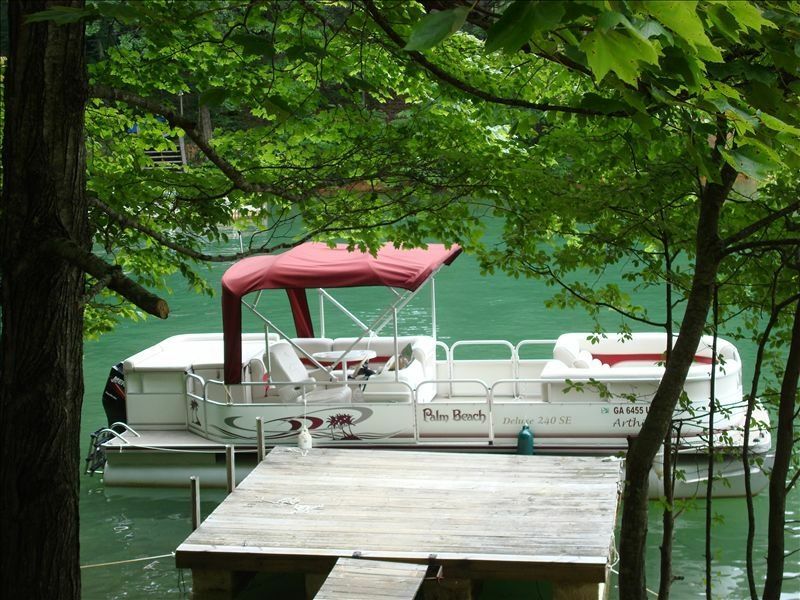 Pontoon boat is available during your stay. It can be borrowed for the duration of your visit.